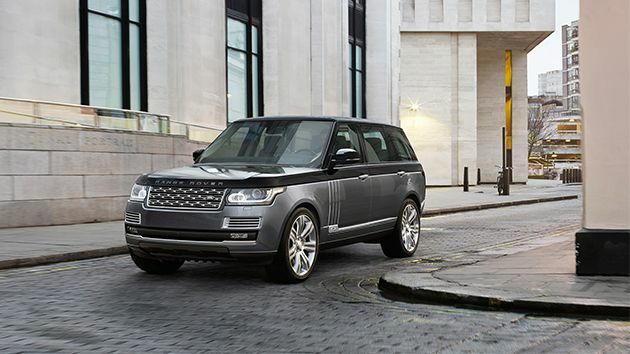 If the sumptuous leather seats, cutting-edge infotainment system and massively raised ride height of the standard Range Rover isn't quite opulent enough for you, there is good news. The British purveyor of almighty Chelsea tractors has just announced that it is to create a new SVAutobiography version of its best-selling Rangie for next year, which features bespoke two-tone exterior paint, chrome accents and a unique front grille. But wait, there's more. The whopping £148,900 price tag also bags an interior that is decked out in aluminium, rear tray tables that can be deployed and returned electronically, a rear chiller compartment for bottles of bubbly and luxurious deep pile carpets. There are even a couple of neat Windsor leather seats that can be slotted into the tailgate. Dubbed 'Event Seating', these plush thrones are perfect for watching the polo, lording over a picnic or punishing naughty children that speak without being spoken to. Although, Range Rover does state that these seats haven't been designed for use when the vehicle is in motion. Customers will be able to choose from a selection of V6, V8 and hybrid powertrains, as well as the meaty 542bhp 5.0-litre supercharged V8 from the Range Rover Sport SVR, which has be retuned to offer greater refinement and comfort. So, if you can't wait for Rolls-Royce and Bentley to release their ludicrously lavish SUVs, the posh new Range Rover should suffice in the meantime.